A seemingly boring dish that could pass for your old favorite manicotti shells. Update 2018: this marinara sauce is one of many of the 36 recipes in my new Instant Pot for Beginners eBook! Click below to get your copy! In other news, I also started Snapchatting (add me! @barerootgirl). Which is so, so fun. And has been a great way to stay engaged with people about my recipe creation since it’s so quick and unfiltered. Warning, I do share just about everything I eat over there… And selfies! And my voice! It’s pretty crazy, guys. It sounds so ‘blah’ but it tastes sooo the opposite of that! 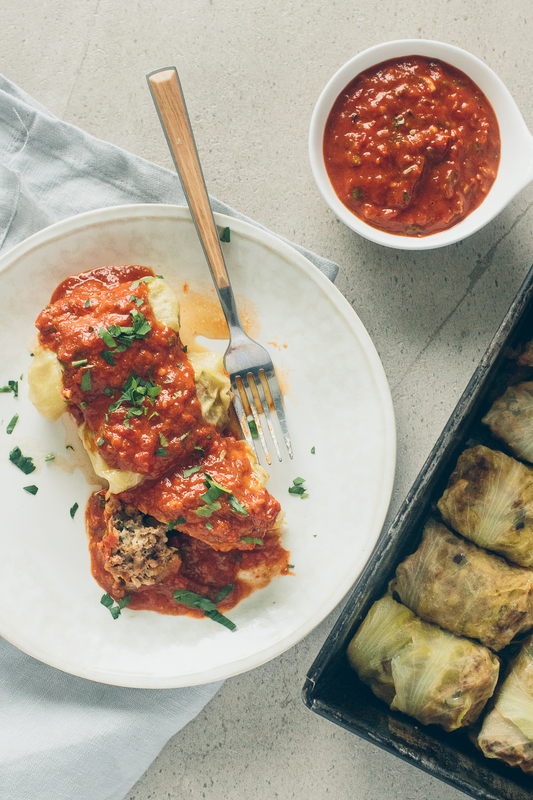 Honestly, I had seen a bunch of cabbage rolls on Pinterest from the Paleo folks I follow and while I love trying new things, it never really called to me. This recipe is exclusive to BRG subscribers! Join the tribe below to get your copy!